Russia Formed Caspian Sea Special Operations Unit 4.8 out of 5 based on 5 ratings. 5 user reviews. The Caspian special operations unit will transport and evacuate special forces units on high-speed boats. According to Izvestiya, Caspian Flotilla has formed a new special operations unit, dedicated to conducting shore operations, such as covertly transporting and evacuating reconnaissance teams, covering them with fire and conducting raids. The unit will take care of security of sea bases and coasts. The unit will be equipped with Raptor high-speed patrol boats and Tachyon drones. According to the experts, the unit doesn’t have a military-political use. The unit was created as an extension of the Russian Navy, as “coastal” special operations units can be a useful asset in special operations taking place on sea. The Raptor high-speed patrol boats are to be delivered to the unit until the end of the year. Tachyon drones will be used for covert landing on shores and for discovering enemy saboteurs under water. The unit’s personnel is currently unknown at the moment, although supposedly, the unit will contain several diver and diver-miners platoons, and coastal troops. Armored project 03160 Raptor high-speed boats will be the main means of transport for the unit. They’re 16m long, capable of transporting up to 20 fully equipped soldiers. Powered by a 2,000hp engine, the Raptor patrol boats can reach a top speed of approximately 50k. They can execute missions in a radius of 100 miles (160km) from its operating base. The boat is fitted with a remotely operated weapon station to hold a 14.5mm machine gun, as well as a gyro-stabilised, electro-optical module. The gun has a firing range of 2,000m and is used for defence against weapon systems and armoured targets. The electro-optical module provides target detection up to a range of 3,000m. Russia provide Caspian sea countries access to Black sea through Volga-Don channel!.. 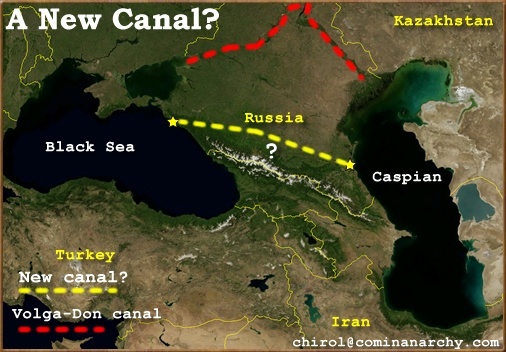 Are Russia also building another canal, linking the two seas?